Process: Ball shaped Oolong with medium roast. 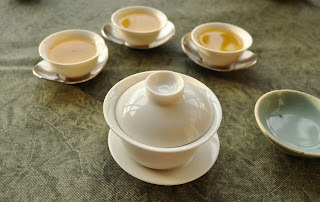 Test brewing in a porcelain gaiwan and 3 classic cups. No weighing of the dry leaves and no timing of the brews. The leaves are small with few stems and the color appears dark green. It looks very well sorted, the kind of process that is used for competition Oolong. The color of the brew is dark yellow and has good clarity. The dry leaves have a very pleasant roasting scent that mixes well with the natural scent of the fresh tea. 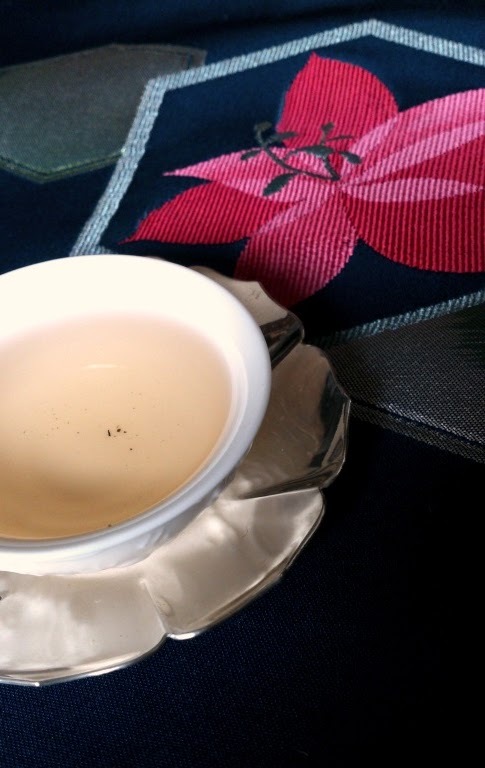 It's a familiar scent that transports you to one of those old Taiwanese tea shops that still roast their teas. These scents are quite intense thanks to the roasting. They combine fruity, honey and fresh sensations. It has a slight astringency and bitterness, but the taste that dominates is mellow and sweet. It has plenty of 'body' or structure to borrow from the wine tasting vocabulary. The roasting is most present in the first brew and it makes the tea feels stronger, riper and sweeter. 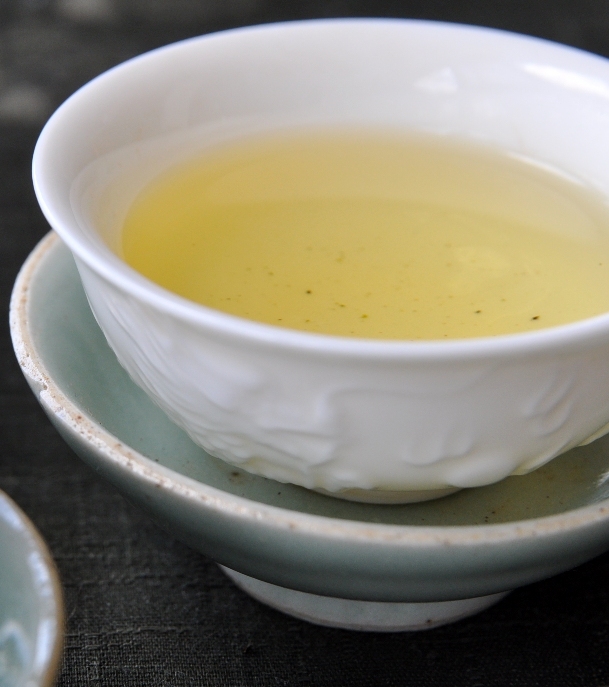 The taste lingers for some time in the mouth and creates a smooth and warm feeling in the throat and down to the stomach. 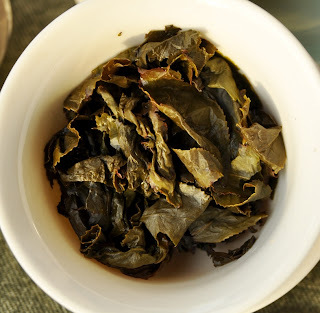 Roasted Oolong leaves take longer to open up. 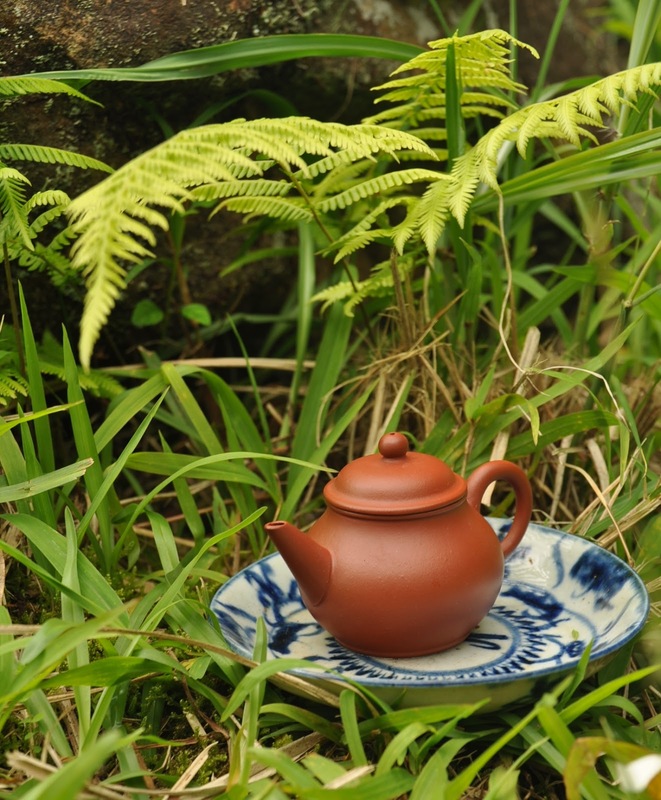 With this tea, we see that the leaves expand and return almost to their original state. Even the color remains fairly green. 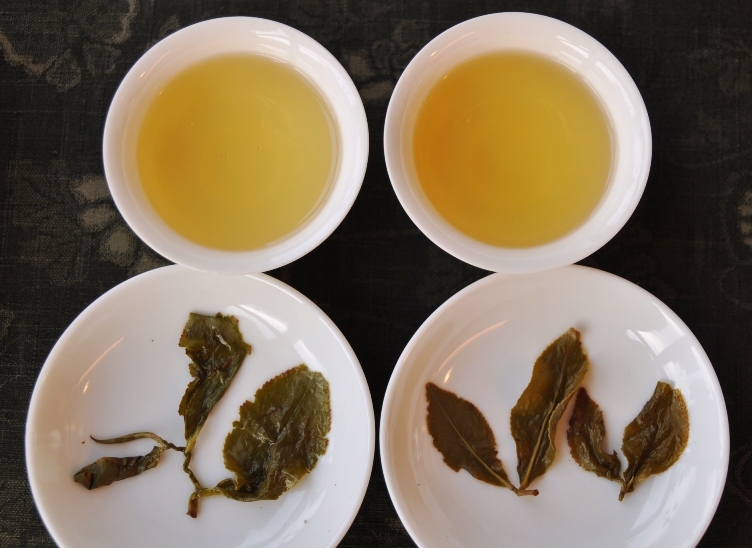 This is a sign of excellent roasting skills: the tea's flavors are stronger, the taste sweeter, and at the same time the freshness of the leaves is still well preserved. 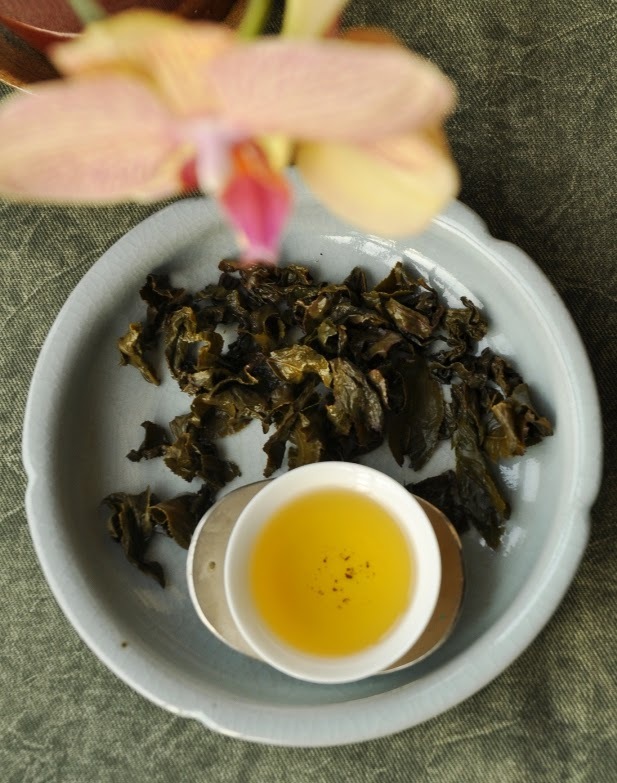 It doesn't have the elegance and fine notes of a high mountain Hung Shui Oolong, but it has almost everything else. 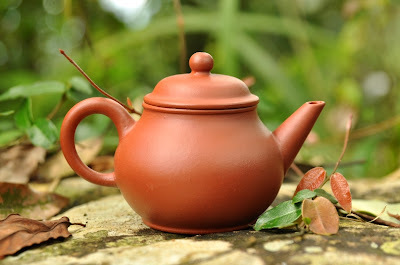 Thanks to its low price, it's a tea that can be brewed daily, in a big or small teapot. 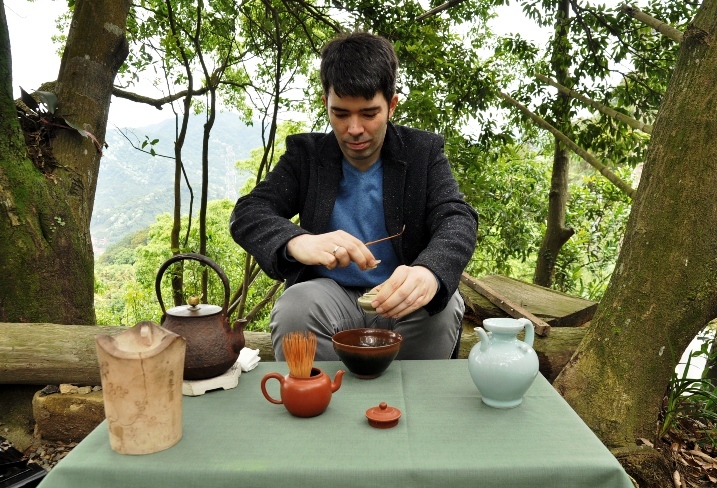 Here I'm using a gaiwan for analysis, but this is a tea that would benefit from the use of an Yixing teapot. 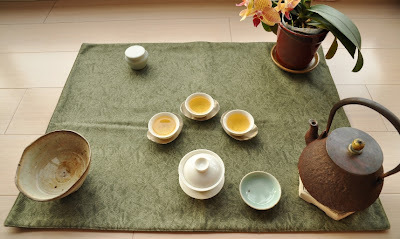 One way to appreciate great teas is also to experience more humble teas from time to time, especially when they are so easy to drink. This tea also offers a good opportunity to practice your brewing skills and try to make it taste the best it can. It won't break your heart (and your wallet) if you make a mistake. My Chaxi is inspired by this union of green freshness and (roasted) warmth. Enjoy! 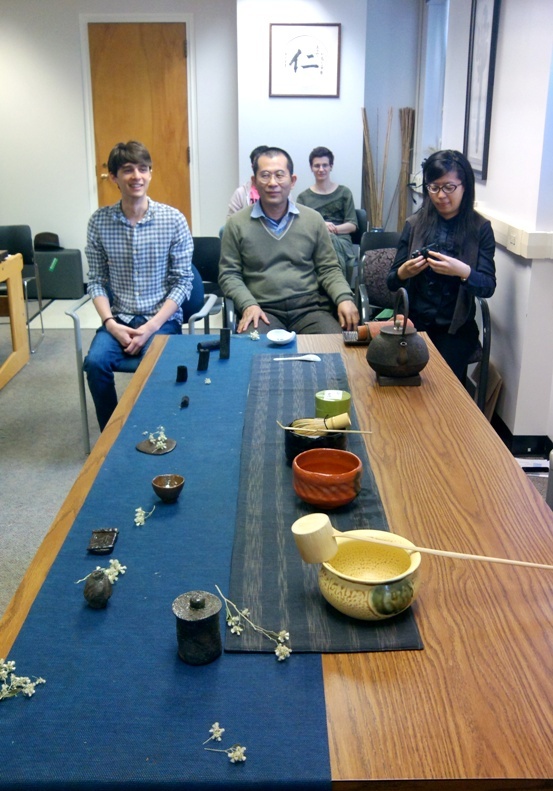 This spring, between 2 tea events at the Tea Institute at Penn State, we had the pleasure to be invited for a bowl of Japanese tea, twice! 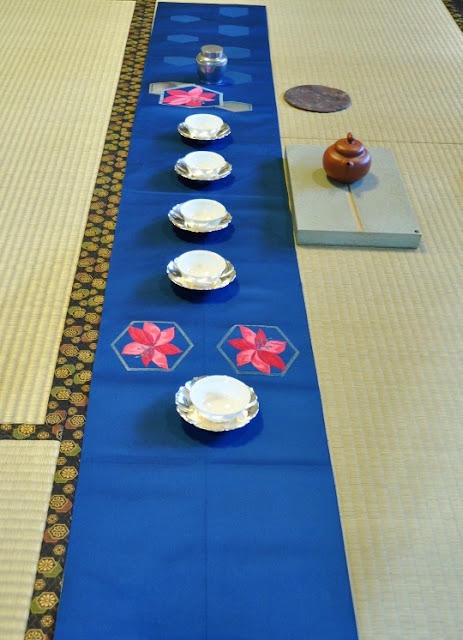 The first time, Mary H., a senior tea student at Philadelphia's Urasenke school, performed a formal tea ceremony on the Institute's tatami mats. 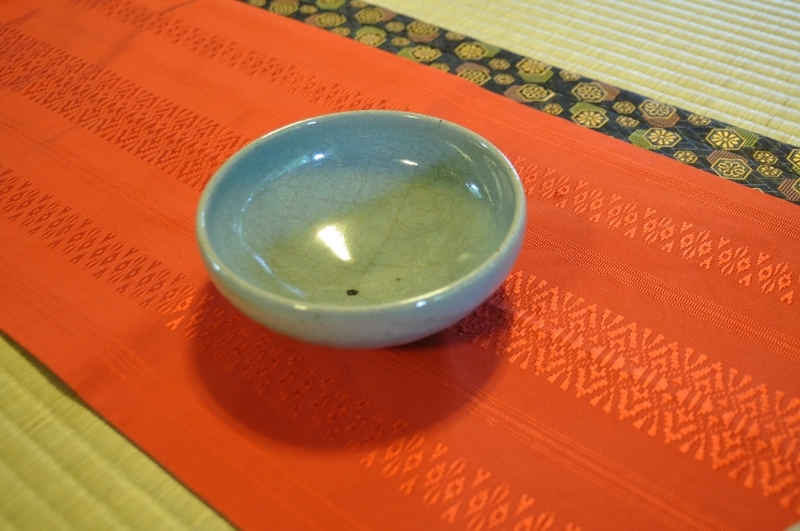 The folding of the red cloth (fukusa) was done with grace and precision. Just that was quite a show and made me think of all the practice Mary must have had repeating all these steps so well. At first sight, it may seem that the Urasenke school is over doing it with this cloth: What connection is there between this complex, traditional folding and the quality of the tea? I see several important connections: first, it teaches you an attention to details, to being graceful and the importance of clean ustensils. 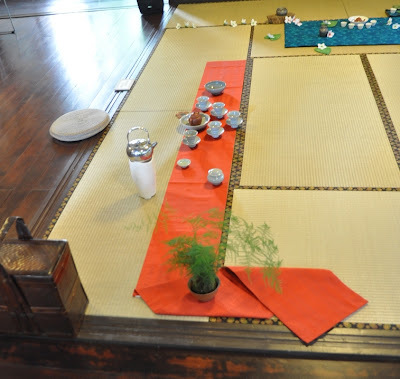 The second point is that this folding ceremony before the tea ceremony helps to calm down and focus your mind, so that you are getting ready to perform and enjoy your tea. 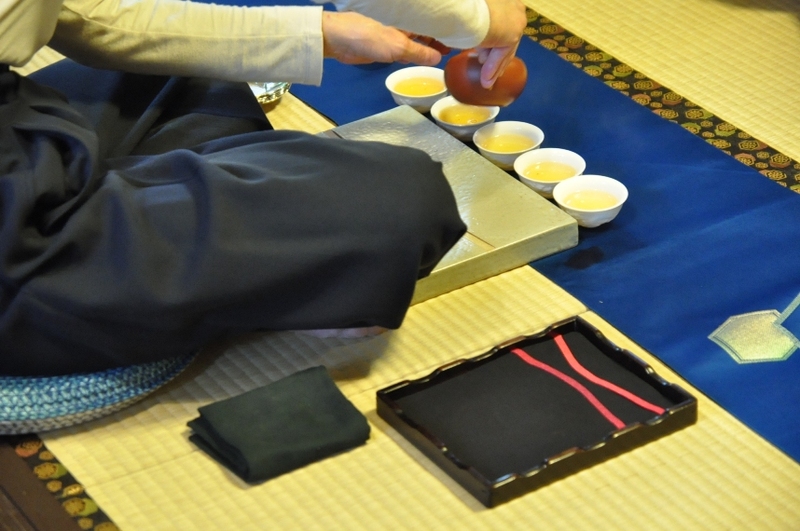 All these strict rules in the Japanese ceremony help and guide the tea student to pay more attention to his/her tea brewing. This tea was done in a very traditional, ceremonial way. The only way this experience could have been more authentic is if Mary (and us) had worn a kimono! 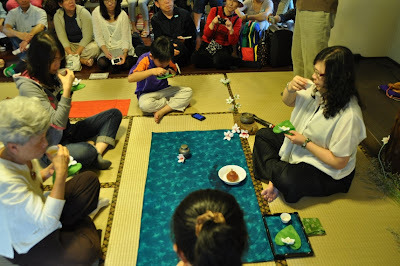 A couple of days later, Mr. Koike prepared a bowl of matcha for all the participants at this event. 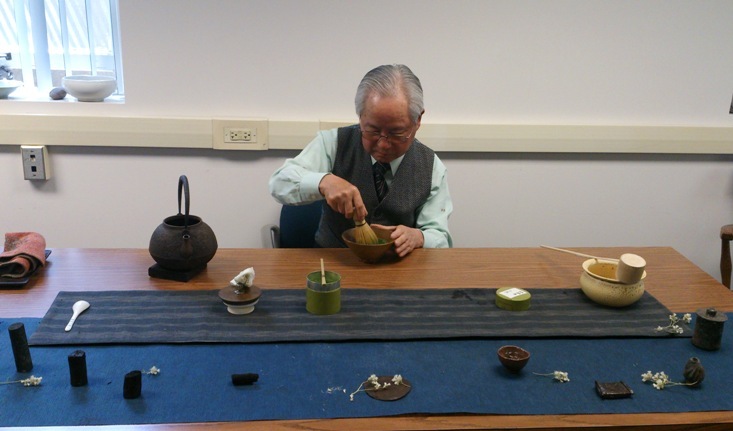 This 76 years young Japanese tea enthusiast is a big supporter of the Tea Institute. 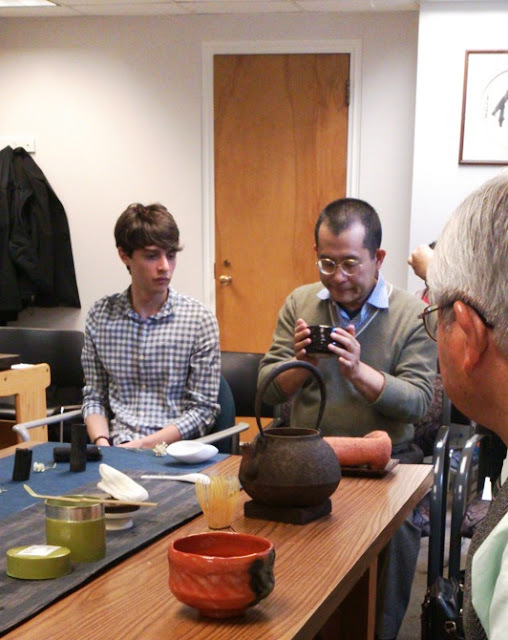 He feels it's important to learn and preserve the culture and traditions of Japanese tea. But he feels this knowledge isn't something that should make you feel constrained, uneasy. 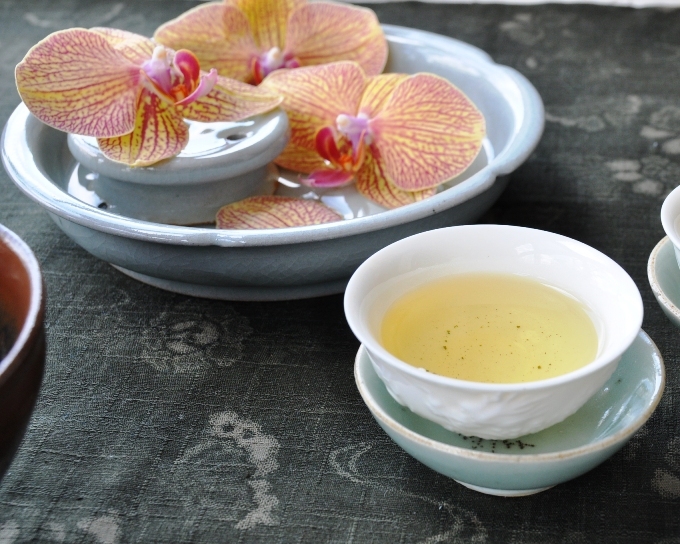 On the contrary, the main purpose of tea is to enjoy life and friendship. Tea should be part of this life, not something that feels separate and full of dust. An Omotesenke school practitioner, Mr. Koike (like Mary) brought us Japanese sweets to pair with the matcha. 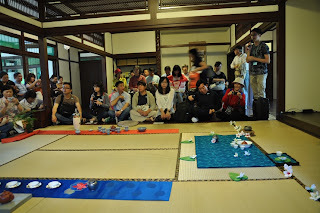 But he didn't want to move to the tatami. 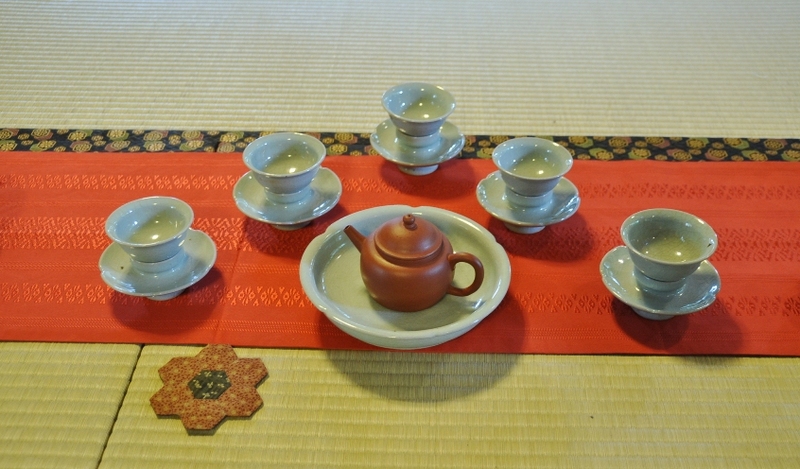 It was more convenient to use this table and the Cha Xi set up by Teaparker. 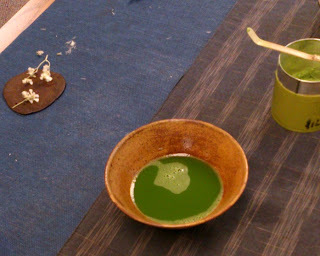 Mr. Koike simply whisked one bowl after another and, very quickly, we all could enjoy a bowl of matcha. The essentials were preserved: water had reached a boil in the tetsubin, the tea quality was high, the bowls were clean and suitable for tea and Mr. Koike performed with the assurance of years of experience. 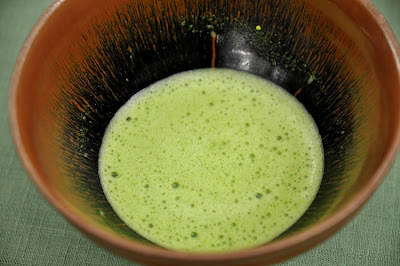 This Omotesenke style matcha looks and tastes very different from the Urasenke matcha. 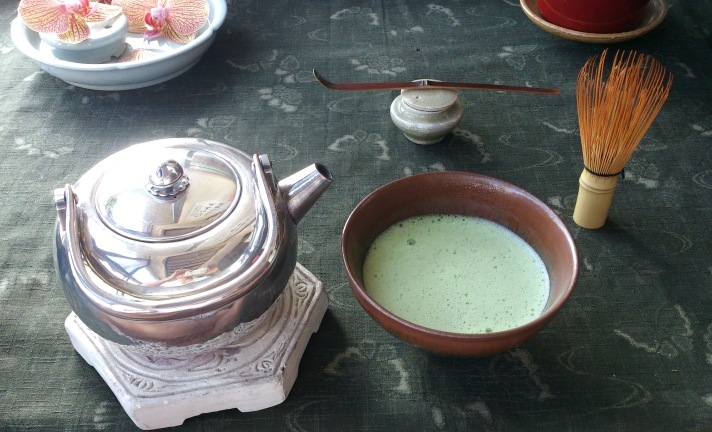 We can see that Omotesenke doesn't produce much foam, but still manages to well mix the green tea powder with the hot water. 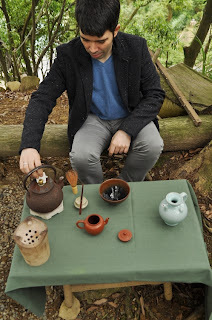 Mr. Koike's tea had its intented character. He made the complex seem simple, almost casual. This kind of improvisation could only succeed because he is a master of the formal technique. 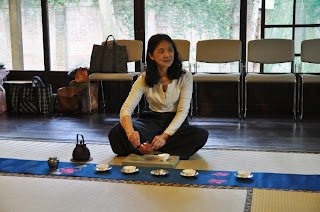 A couple of weeks ago, I had the chance to have tea with another longtime Japanese tea master, my friend Kim. I took him to the hills of Tucheng to taste some of my spring Oolongs. But before that, I surprised him with my Sung dynasty tea equipment. 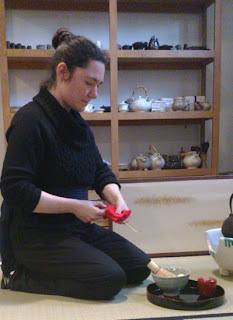 Kim is a teacher in Germany for the Uedo Sôko tradition. 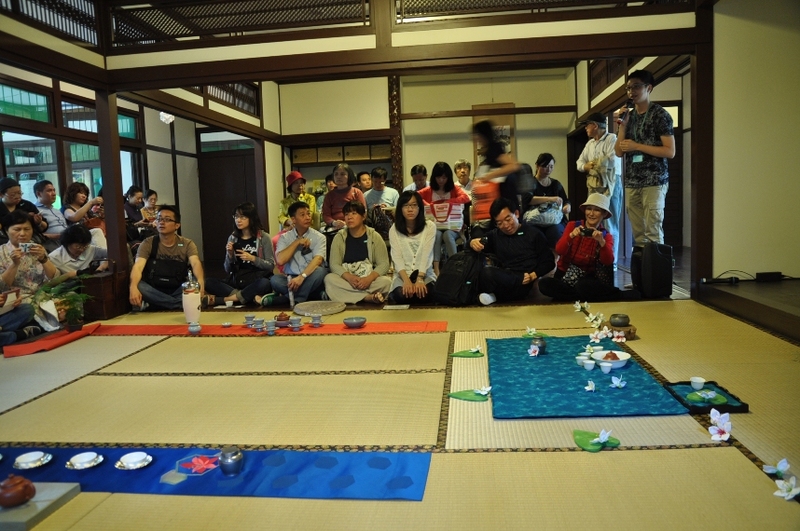 This school was founded by a samurai who had learned from Sen no Rikyû. For Kim, this way of preparing matcha is 'free style'. And outdoors ceremonies are the hardest to perform, because the environment is so distracting and uncontrollable. Nevertheless, like with Mr. Koike and Mary, I was impressed by his ability to seamlessly calm down and focus on the tea preparation. His tea was much stronger and thicker. It should be drunk in three and a half swallows. (The last half one is for the foam). It was exactly the boost of energy I needed! 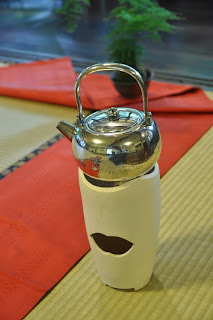 We placed bamboo chasen in my zhuni teapot so that it would be blown away by the wind! And Kim folded a white tissue paper to serve as his fukusa to clean the bowl and hold the lid of the tetsubin. The foam appears rich and this tradition intends to have a little foam elevation in the middle of the bowl. 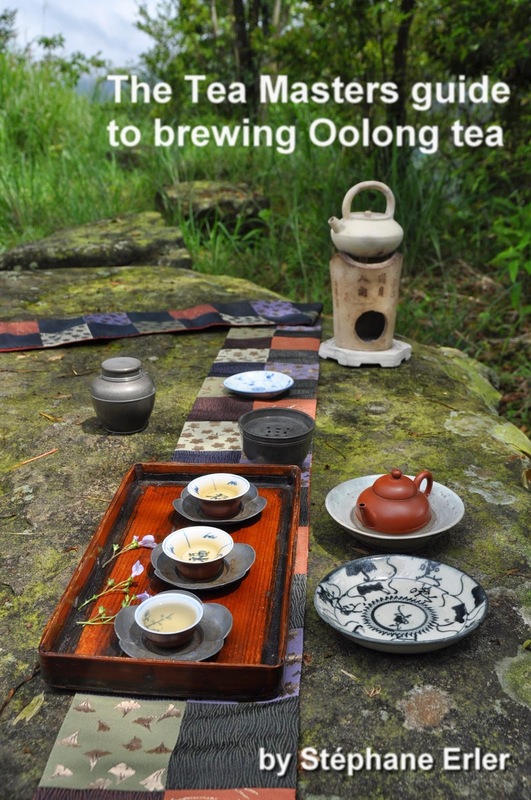 This is also the case for Sung dynasty tea. The straight whisking technique is also close to what I have learned. 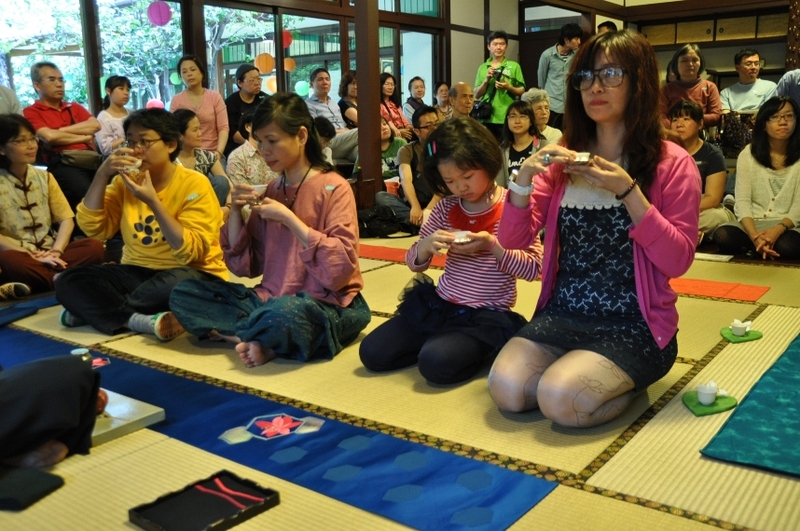 But this tradition uses less water, which makes for a more concentrated bowl. It's the 'green tea espresso' for strong men (and ancient samurai)! 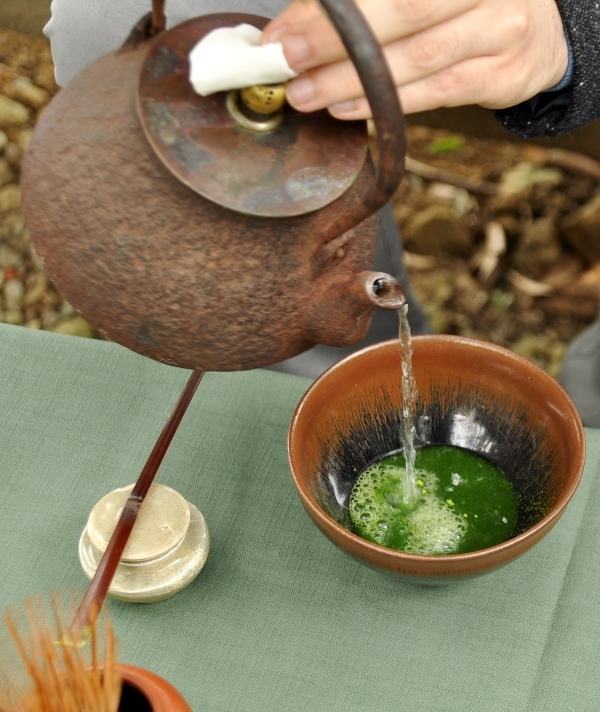 Japanese matcha tea schools have the longest and strictest traditions. But we can see that their most experienced practitioners are able to go beyond and don't feel limited in what they can do. On the contrary, a good understanding of what's important in the technique helps them to adapt to various situations. 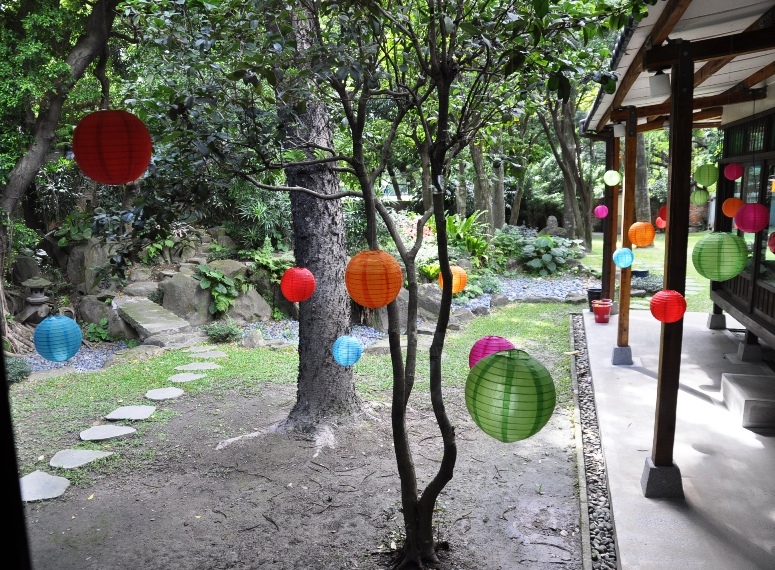 It also gives them the means to be more creative with their Cha Xi arrangement. To make tea part of your life and enjoy it fully, you first have to learn to master its traditions, and then practice it with your own, creative, free style. 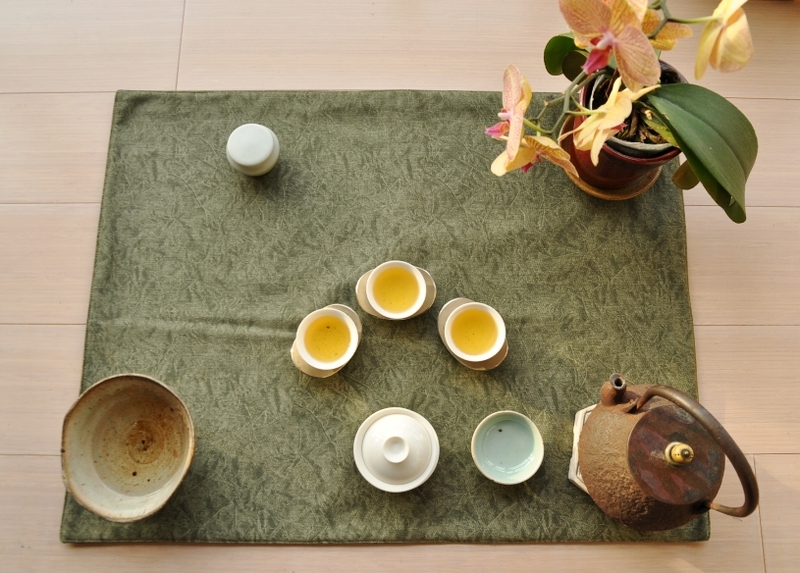 Process: Oolong à oxydation légère, roulé en boule sans torréfaction. Testé en mode de compétition: 3 grammes pour 6 minutes d'infusion en porcelaine blanche. Ci-contre, il s'agit exactement du même thé que ci-dessus, mais cette fois-ci les feuilles ont été torréfiées de manière douce et lente. 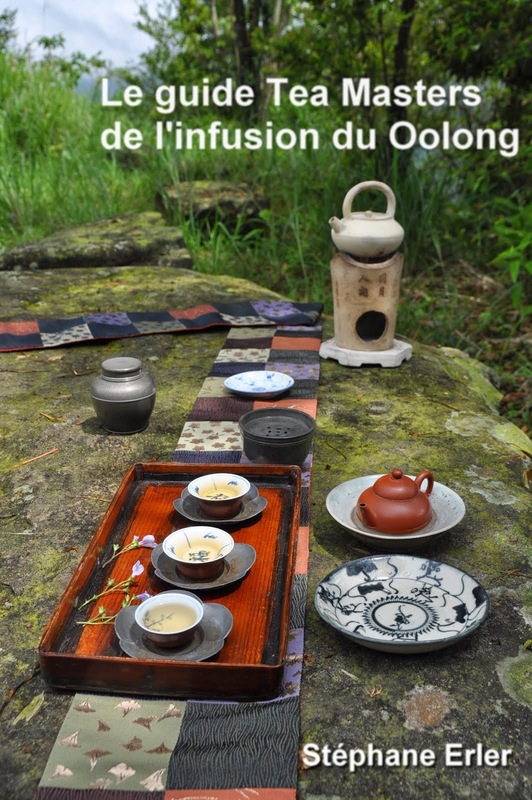 Aussi, il s'appelle Hung Shui Oolong, car son infusion est plus rougeâtre. Jusqu'à présent, je n'avais proposé que la version torréfiée de ce thé (voir hiver 2011 et spring 2012). Cette année, j'ai trouvé la version fraiche très réussie avec son odeur particulière de groseilles à maquereaux. Le goût est légèrement fruité, sucré/acidulé et frais. 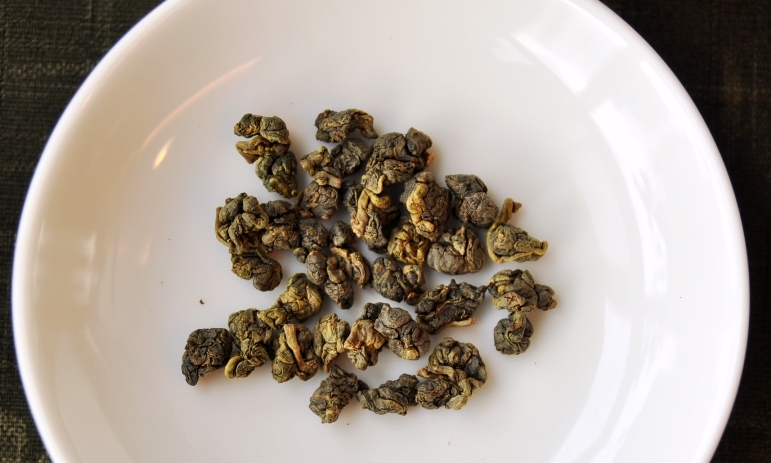 Il a les qualités d'un bon Oolong de printemps de Taiwan. 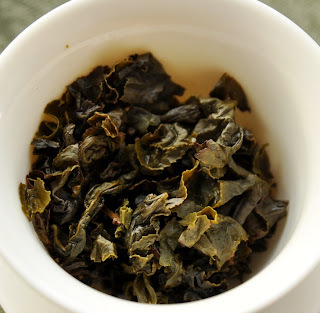 Préparé avec soin, cet Oolong frais peut presque passer pour un Oolong de haute montagne! Il peut être éducatif de le comparer à un Shan Lin Shi pour découvrir l'impact de l'élévation de la plantation. A Yiguang shan, on n'est plus en plaine, mais on n'est pas encore en haute montagne (il faut plus de 1000 mètres pour cela). 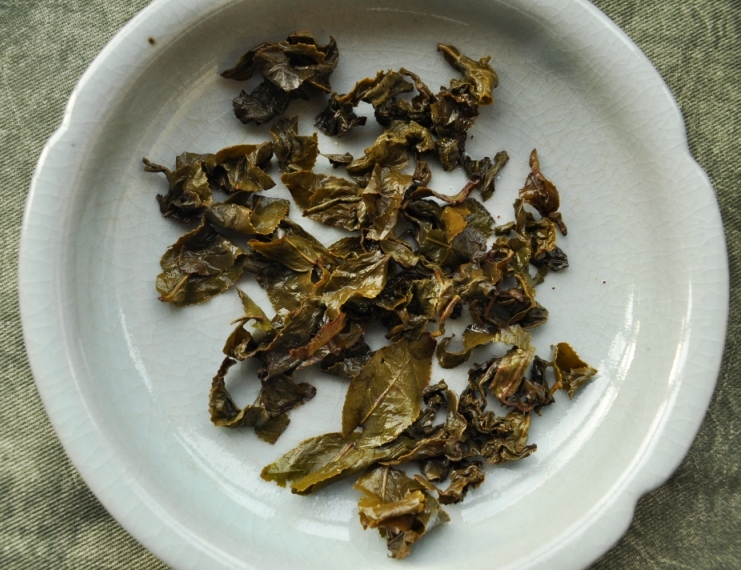 Aussi, cet Oolong partage certaines caractéristiques des Oolongs de haute montagne, mais à un prix plus abordable. En contrepartie, ce qui lui manque c'est la force et la finesse des Gao Shan Cha. Ce n'est pas très grave si on s'en sert comme thé de bureau. (En préparation 'gongfu', on pourra compenser ces défauts avec un peu plus de feuilles pour la force et une technique 'douce' pour la finesse). On remarque que les feuilles ne sont pas aussi grandes et épaisses qu'en haute montagne. L'oxydation est visible sur les bords des feuilles. Elle est plus importante qu'en haute montagne, car cela convient mieux au caractère de ces feuilles. La torréfaction, elle, donne une couleur plus brune à toute la feuille. Torréfiées, elles mettent aussi plus longtemps à s'ouvrir. La version Hung Shui (à droite sur les photos) de ce printemps a un goût plus mielleux, moins crue que la version fraiche. La première infusion fait surtout ressortir ces notes de baguette grillée et aussi de pâte d'amande, dans une moindre mesure. Dans les infusions suivantes, le côté fruité apparaitra plus nettement et l'on finira par retrouver ces notes de groseilles. Pour ce qu'on perd en fraicheur, la torréfaction ajoute en intensité aux odeurs et au goût du thé. 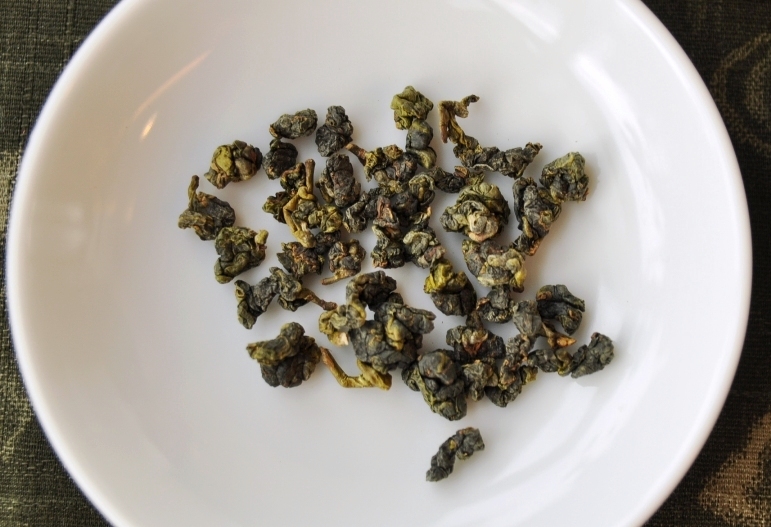 Aussi, le Hung Shui Oolong convient bien à des infusions avec une eau plus dure. On remarquera moins les défauts de l'eau qu'avec la version fraiche et légère. Sa torréfaction permet aussi de bien stabiliser ce thé pour sa conservation. Do you feel that your tea changes from brew to brew? Not just that the leaves get depleted the more they are brewed, but that some brews come out better than others? This kind of experience is even more obvious in a tea class, when several people brew the same tea with the same water and same ware. The brews are never exactly the same. 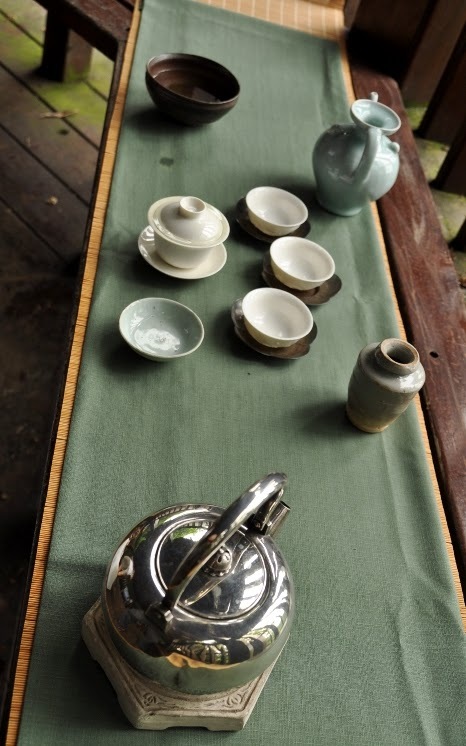 These 'differences' are the second, quiet language used by the tea leaves to communicate with us. So, what does the tea want to tell us with this second language? The tea tells us how well we brewed the leaves. It's like a professor that gives you a grade. The grade may be low, but the message from the leaves is caring and full of hope: if you can hear (taste) this message, it means you have the power to improve your brewing technique. 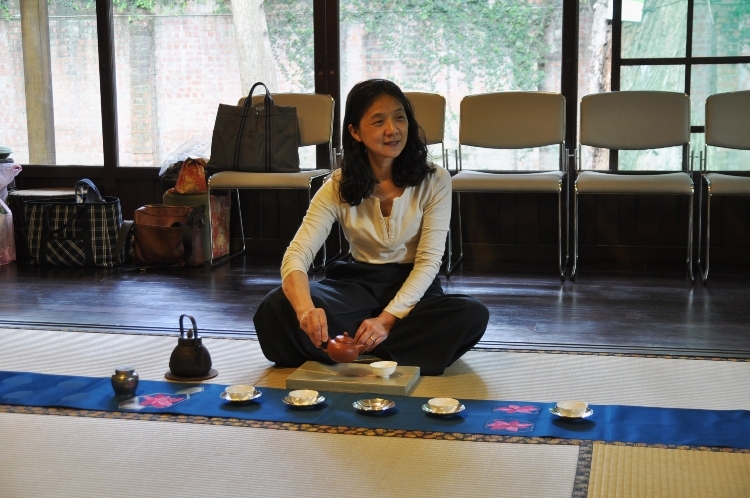 Can the Holy Spirit help you become proficient in this tea language on this Pentecost day?! I don't think that tea is a language taught by the Holy Spirit! 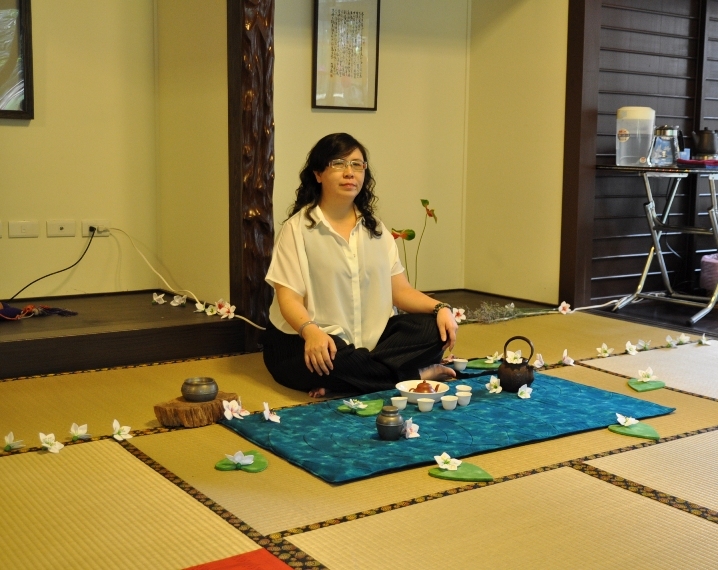 But what we can learn from people practicing faith is the calm, serenity and focus they use when they meditate, pray... There are no distractions, no iphone or computer that distracts their heart or mind. Let's bring this attitude to tea tasting. The quieter you are, the louder the tea will speak to you. Then it's easier to distinguish this quiet voice that tells you how well you have brewed. 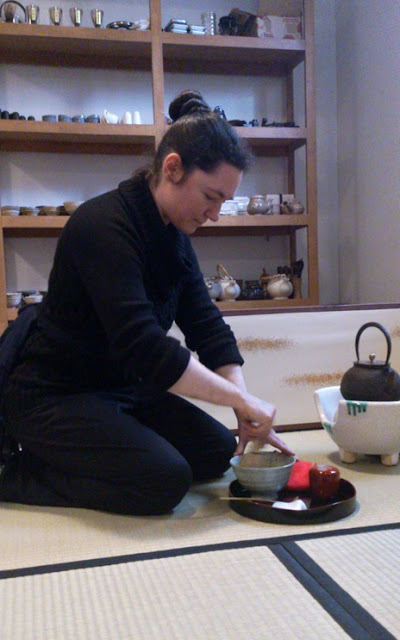 You might then realize that being calm and focused also helps you to make better tea: you don't make technical mistakes (like forgetting to preheat your tea vessel), you take more time to analyze what kind of pour your leaves require or what flavors you want to make come out, and your pouring gesture is smoother. Then, sometimes, it feels a miracle: you experience the perfect cup of tea. The tea flows inside your mouth as if it were a very light and pure water. Then the delicate flavors come out wave after wave. The mouth and throat feel clean and smooth despite all the richness of these flavors. And the body feels the comfortable effects of the tea for several minutes. Good quality tea is necessary, but not sufficient to enjoy this perfection. You also need to learn the quiet language of tea! 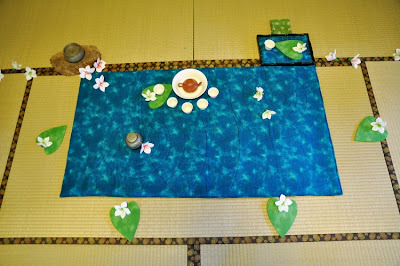 Enjoy a quiet Pentecost Tea time! Parmi tous les trésors que l'on peut trouver à Taiwan, il y en a deux qui ne finissent pas de me charmer et de me retenir ici. Le plus grand trésor sont ses heureux habitants, accueillants et généreux. Son second trésor pousse presque chaque saison dans les collines et montagnes de cette belle île. C'est au plus profond de la nature et au plus haut des sommets que l'on récolte les feuilles les plus précieuses. Elles sont la réunion d'un sol, d'un climat et du savoir-faire de producteurs de thé. (Sans ces hommes et femmes de Taiwan, il n'y aurait pas de thé: voilà aussi pourquoi ils sont le plus grand trésor de Taiwan). 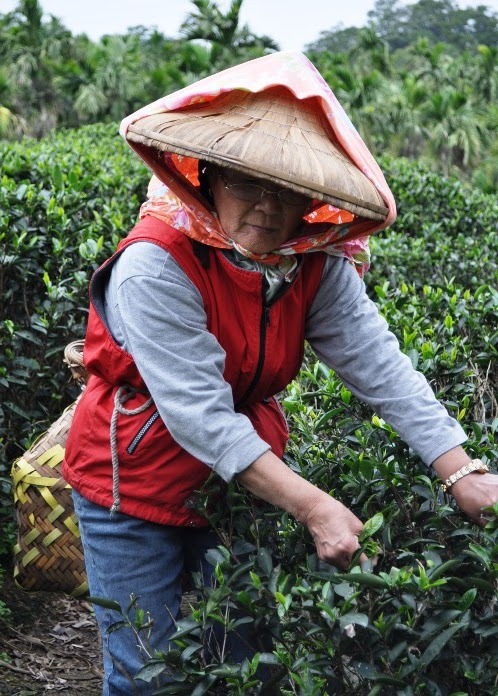 La météo a une influence capitale sur la qualité récolte des thés. Ce printemps avait commencé tôt par un temps très sec et ensoleillé jusqu'à la mi mars. Par après, Taiwan a connu un temps très pluvieux, entrecoupé par quelques jours de beau temps par ci par là. De nombreuses récoltes se firent par mauvais temps, afin de ne pas rater le moment où apparaissent les bourgeons. Pour pallier à ces conditions difficiles, les fermiers ont du compter sur la chance d'éclaircies et leur savoir-faire pour transformer ces feuilles en thé. Trouver de bons Oolongs de haute montagne fut donc difficile: les différences entre un bon et un mauvais batch sont grandes. Les bonnes feuilles sont rares et de vrais trésors cette année! On ne les trouve pas par hasard, mais grâce à un travail de contact et d'étude sur de nombreuses années. 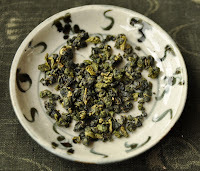 Aussi, j'ai la joie d'avoir pu mettre la main sur du Luanze/qingxin Oolong des 4 montagnes majeures de Taiwan, ce printemps. Chacune a son caractère et son charme. Da Yu Ling (2300 m) et Lishan (2200 m) sont les 2 grandes stars de ces plantations proches des étoiles! Puis, on a un Alishan (1500 m) et Shan Lin Shi (1200 m). Le Shan Lin Shi est le moins oxydé des 2, mais il n'en reste pas moins très moelleux et fin, alors que l'Alishan est plus puissant. 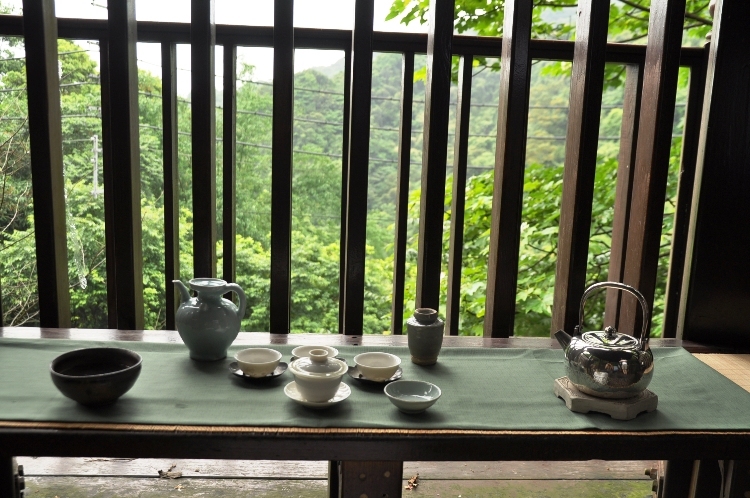 Pour goûter au caractère de la montagne d'Alishan à un meilleur prix, je vous propose aussi un excellent Jinxuan d'Alishan. Il me reste encore un peu de Da Yu Ling d'hiver et des Jinxuan et qingxin Oolongs d'Alishan d'hiver. Voilà de belles opportunités pour comparer le goût des saisons au travers des mêmes feuilles d'un même terroir. 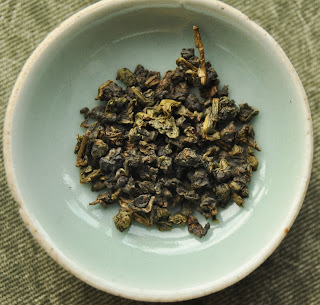 Cette année, j'ai ajouté un Luanze Oolong non torréfié d'Yiguang Shan (700 m) à ma sélection. Il s'agit d'un thé issu de la même récolte que le Hung Shui Oolong (torréfié). 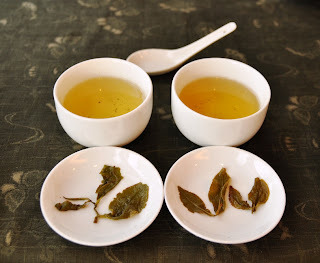 C'est l'occasion de comparer ces 2 thés pour comprendre l'impact d'une torréfaction moyenne sur le Oolong. 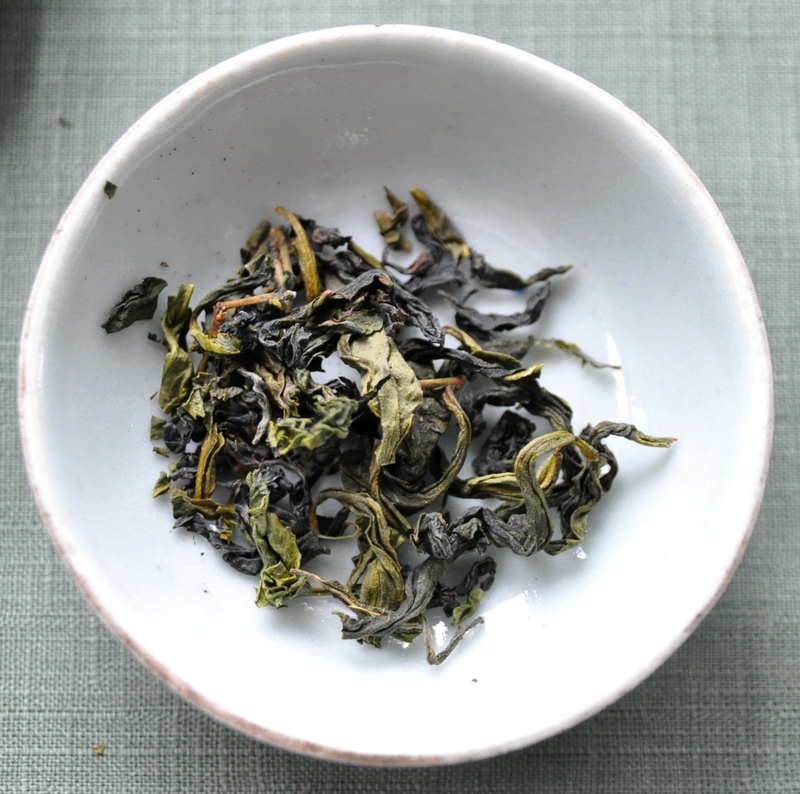 Sans torréfaction, cet Oolong frais a des odeurs de groseille maquereau. Cet Oolong n'est pas de haute montagne (car il a moins de 1000 m), mais il est transformé de la même manière. Arriverez-vous à faire la différence? 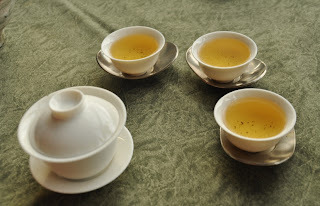 Ces Oolongs de moindre altitude ne sont pas des thés d'exception, mais l'on peut passer du bon temps avec eux aussi. 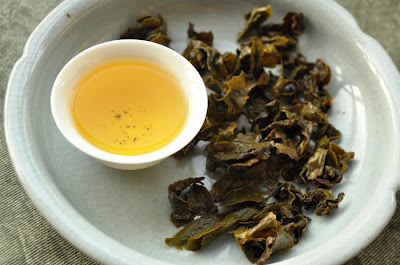 Un très bon exemple de torréfaction réussie nous vient d'un Hung Shui Oolong fait avec le cultivar jade oolong (prononcé tsui yu ou cui yu) récolté à Zhu Shan. C'est aussi là-bas que je trouve mon jinxuan Oolong dans la catégorie fraiche pour tous les jours. Du Wenshan, j'ai sélectionné mon Baozhong 'forêt subtropicale'. Fait également avec le cultivar le plus noble et traditionnel de Taiwan (le qingxin/luanze Oolong), ses arômes diffèrent encore des luanze Oolong ci-dessus à cause de leur terroir et de leur process un peu différent, sans roulage des feuilles. 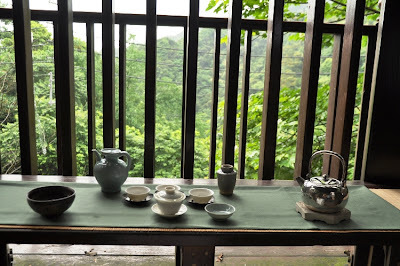 A Wenshan, dans le nord de Taiwan, on trouve aussi un peu de thé vert. 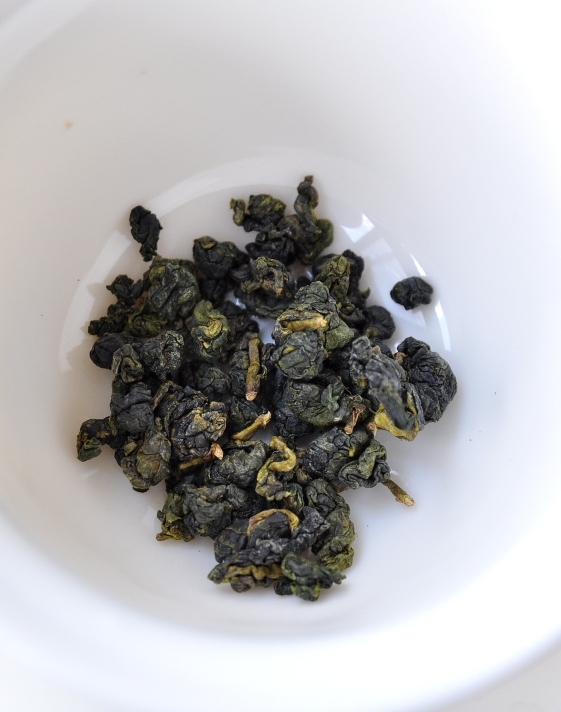 En plus du Biluochun de San Hsia (qingxin ganzhong), j'ai pris thé vert de Pinglin fait avec ce cultivar qingxin (luanze Oolong). 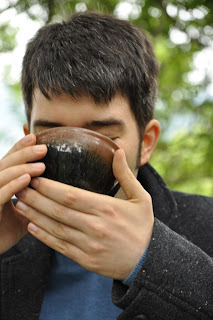 Il est intéressant de sentir les puissantes fragrances de ces bourgeons à l'état de thé vert. Chaque thé est un voyage! 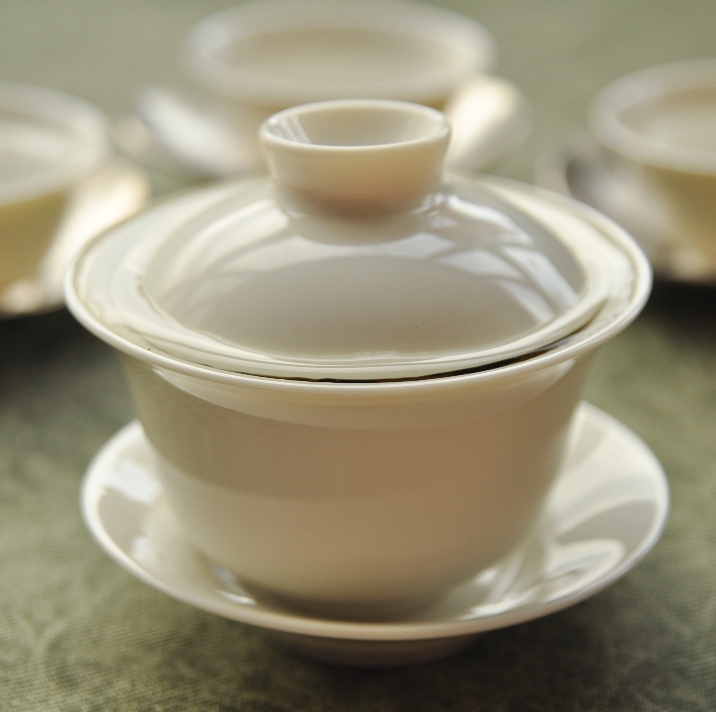 The use of silver for tea ware dates back to the very beginning of tea consumption during the Tang dynasty. 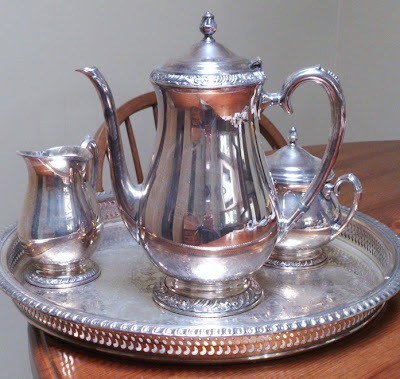 The reasons for using silver in the tea preparation haven't changed much since. Silver is a precious metal that only a minority can afford. This tea set, for instance, isn't mine, but it belongs to an aunt I visited recently in San Francisco. It is a silver (plated?) set marked 'Henley Community'. She must have bought it some 50 years ago! She had it on display in a glass cabinet in her dining room. 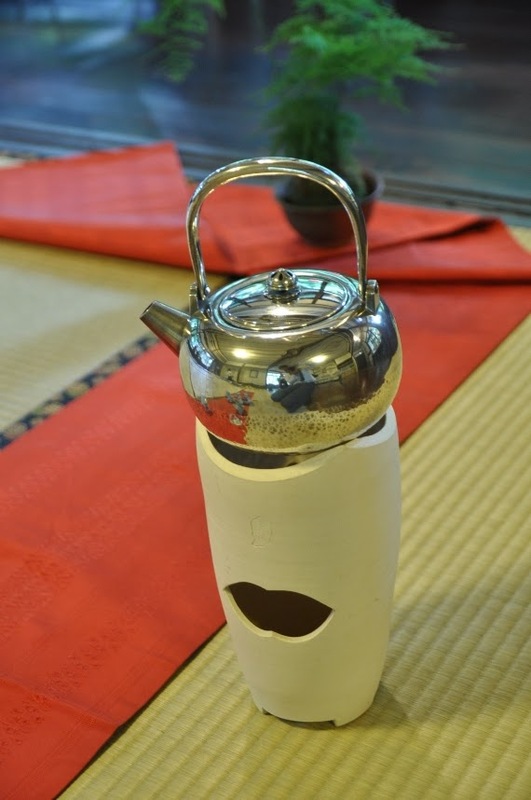 I rushed to take it out and put it to good use with my red teas. 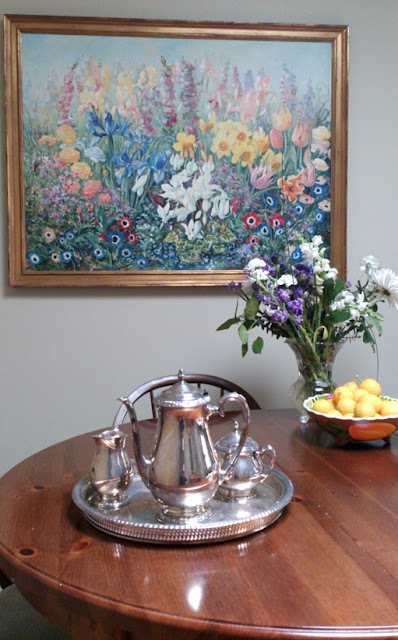 Silver teapots produce a very strong and yet clean tasting tea brew when you use good tea leaves. The high heat conductivity of silver helps get the most out of the leaves. 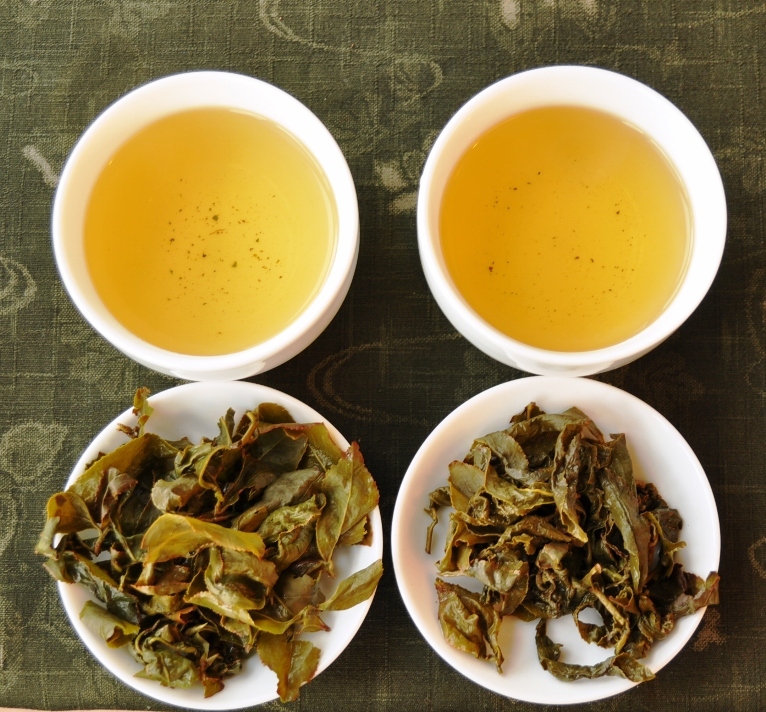 This is the reason why silver is best suited for top quality teas with tips. 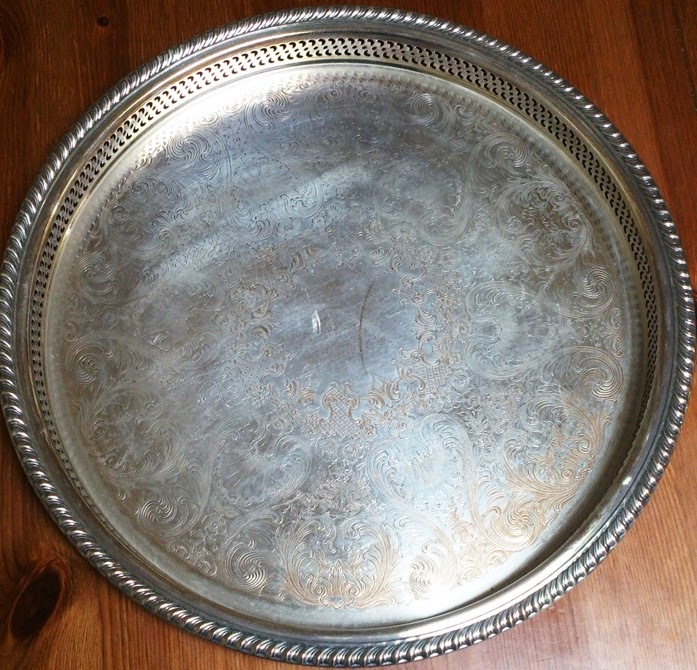 And the antimicrobial properties of silver give this very clean and pure taste. These are very practical reasons that make silver well suited to brew tea. 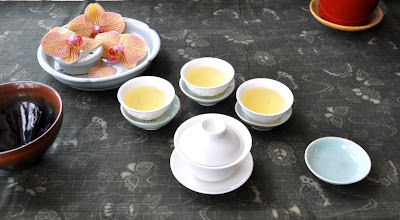 Silver tea ware reminds us that the joy of tea aims at elegance, beauty. Not just to the eyes, but to all our senses: delicate smells, a lively and pure mouthfeel, smooth surfaces to touch, a pleasant quietness... A beautiful vision is only a beginning. 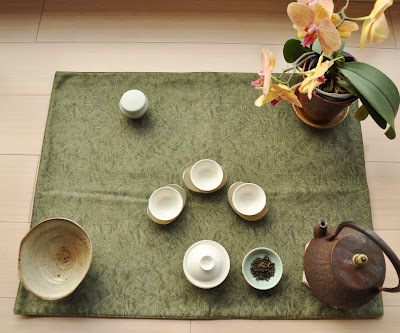 Tea asks to be experienced with all out attention. Again and again. 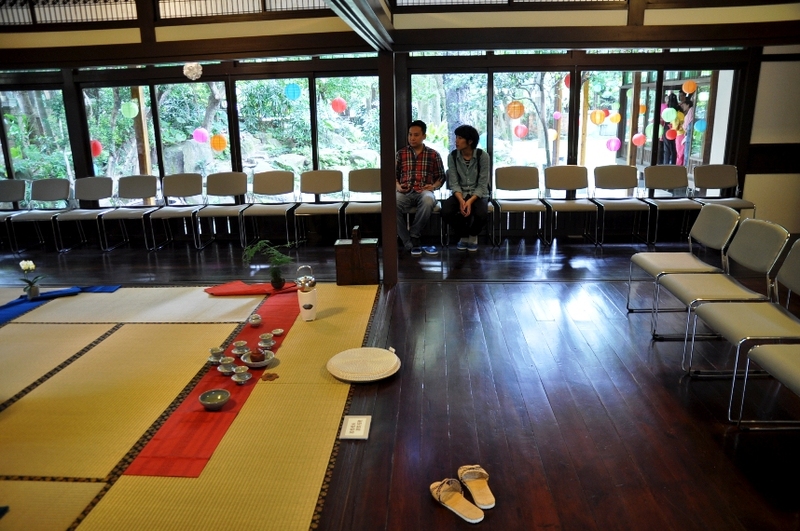 Dans le cadre des événements mensuels de Teaparker pour le Taipei Story House, nous avons préparé 3 thés dans la maison japonaise de l'université Tatung, au nord de Taipei. Ce fut la demeure du fondateur de ce grand groupe industriel Taiwanais durant la période japonaise de l'ile (1895-1945). Elle a été restaurée et son accès n'est généralement pas ouvert au public. Ce fut donc une occasion spéciale de pouvoir y préparer un thé dimanche dernier. Un très large public est venu assister à notre démonstration et au discours de Teaparker. En fait, il s'agit plus d'une conversation interactive avec les gens présents. Teaparker aime bien poser des questions sur le thé, et il récompense les bonnes réponses avec la participation au Cha Xi. Linda, au centre, est la première à infuser son thé avec son Cha Xi dédié aux fleurs Tong. Linda utilise une thé zhuni, une tetsubin, un tea caddy en étain et des coupes Dehua (Blanc de Chine) du 18ème siècle. Elle a réalisé son Cha Bu, ses socles et les fleurs elle-même! 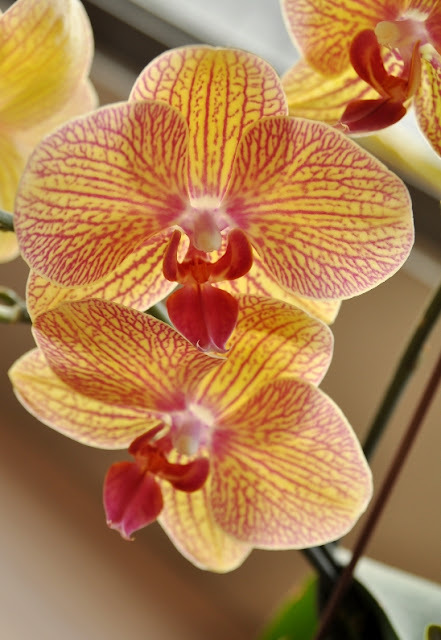 N'ayant pas l'occasion d'admirer les fleurs Tong dans la nature (voir mon dernier article), elle voulut quand même célébrer leur éclosion printanière avec ce Cha Xi. Le public, jeune et vieux, goûta au profond mielleux de son Oolong Concubine organique. Ce goût si sucré et moelleux vient d'une part de la morsure des Jacobiasca formosana Paoli et de l'oxydation plus poussée des feuilles. Boire ce thé, c'est un peu se sentir papillon et aller butiner des belles fleurs de montagne subtropicale! Puis vint le tour d'Evon et son interprétation florale. Elle choisit une très belle ceinture de kimono japonaise bleue. Ses coupes Dehua dragon modernes ont des socles en argent en forme de pétales de fleur. Jarre en étain, petite tetsubin, théière en zhuni et un bateau à thé rectangulaire complètent son Cha Xi. Le public est varié, mais très attentif et concentré. Vient enfin mon tour de présenter mon Cha Xi. 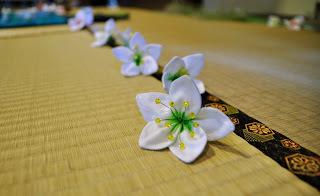 Tout comme Evon, j'ai choisi une ceinture de kimono afin de créer un lien avec ce lieu japonais. Sa couleur convient bien avec le sentiment de chaleur qui émane de mon thé, le Concubine Oolong d'hiver 2011 de Feng Huang. Dans mon Cha Xi, j'ai donc trouvé naturel d'utiliser le set lotus de David Louveau. Ces pièces sont également inspirées par des pièces anciennes chinoises. 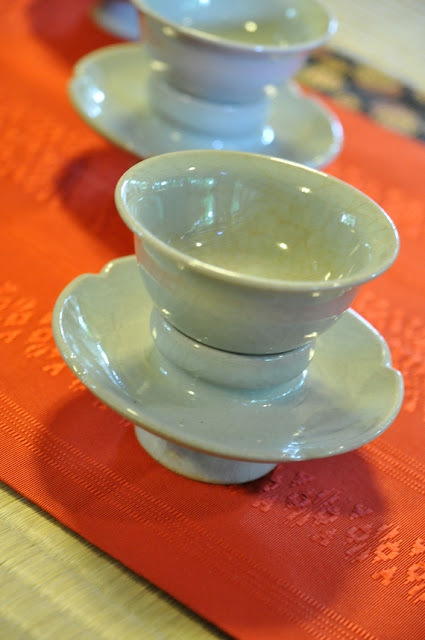 La coupe correspond à une coupe Yuan (mongole) qui elle-même découle des bols Sung. 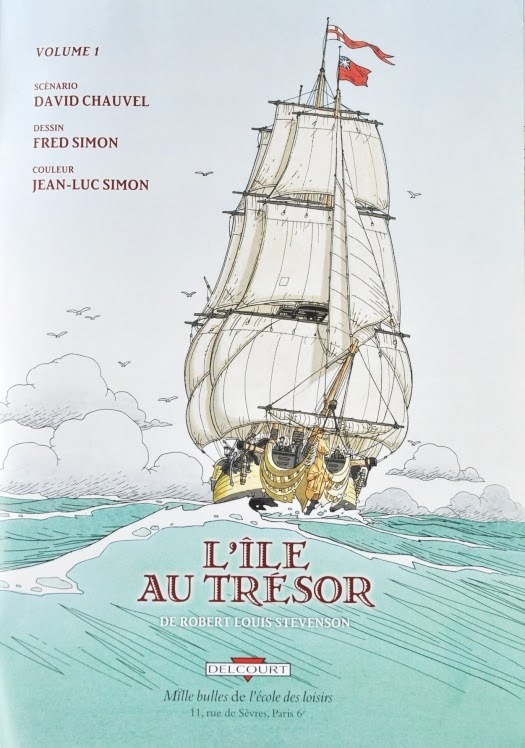 L'émaille de ce set fait d'ailleurs penser à l'émaille Ru, bleue-verte tendre, des Sung. Les incisions sur le pourtour des socle et du bateau à thé font penser à des pétales de fleur de lotus (autre procédé ancien). 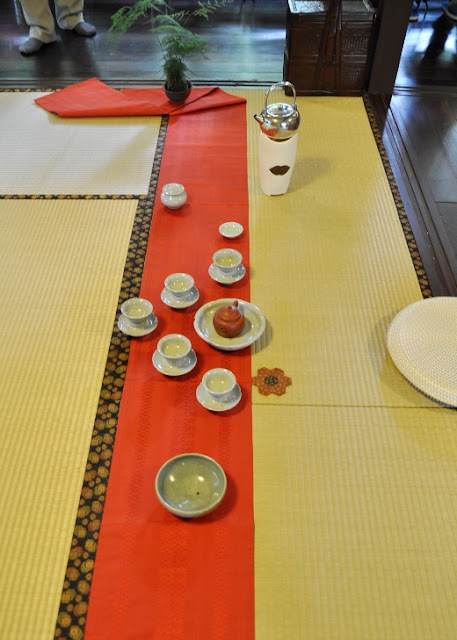 L'art du thé moderne suit l'exemple Japonais: il s'inspire des modèles chinois classiques et se met au service des passionnés. Pour un Cha Xi sur tatami, ce set convient particulièrement bien: les socles surélèvent les coupes qui deviennent plus faciles à prendre ; de plus, ces larges socles évitent les éclaboussures de thé sur le tatami ou le Cha Bu. Finalement, il y a aussi l'aspect émotionnel et personnel de nombreux accessoires. Le set est le fruit d'une coopération de plusieurs années avec David Louveau. Le bol à eaux usées provient d'un de mes premiers échanges avec Michel François, un autre céramiste/potier de talent. Et l'on remarquera aussi un petit quilt de tissu formé par 6 hexagones rouges et un bleu. C'est ma mère qui me l'a fait, et je m'en suis servi pour sécher le bas de ma théière zhuni avant de verser le thé dans les coupes. En regardant la ceinture de kimono de plus près, on se rend compte que sous cette couleur orange unie apparaissent des motifs simples. Je ne connais pas leur signification, leur symbolique, mais ils me font penser à des fleurs petites sur les bords qui éclosent au milieu. (Si un ou une expert en tissu en sait plus, je suis preneur de vos informations!) Cela correspond donc bien α un thème printanier. Ces motifs sont à l'image du thé. Au départ, l'oeil inattentif ne les voit pas. Seule une certaine concentration permettent de faire apparaitre toute la subtile beauté de cet art.